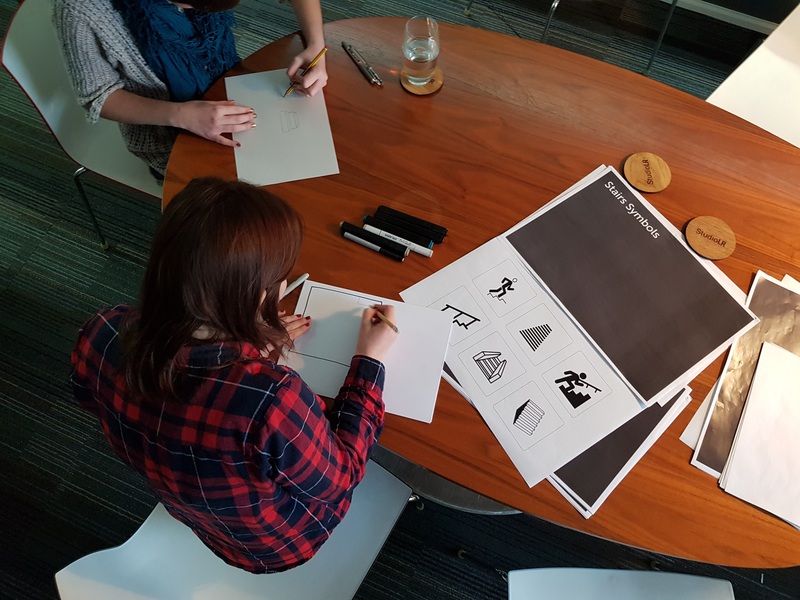 As we move to the end of the year our #InclusiveSymbols project is progressing quickly. 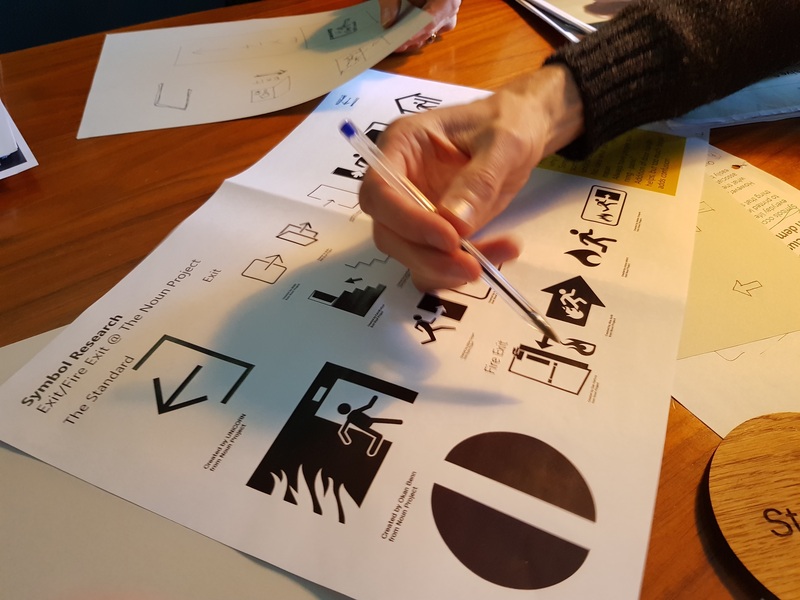 We’ve now completed three concept workshops reviewing around 15 everyday symbols, and we’ve started the exciting (and daunting) challenge of redesigning them to be clear and understood by people with dementia. 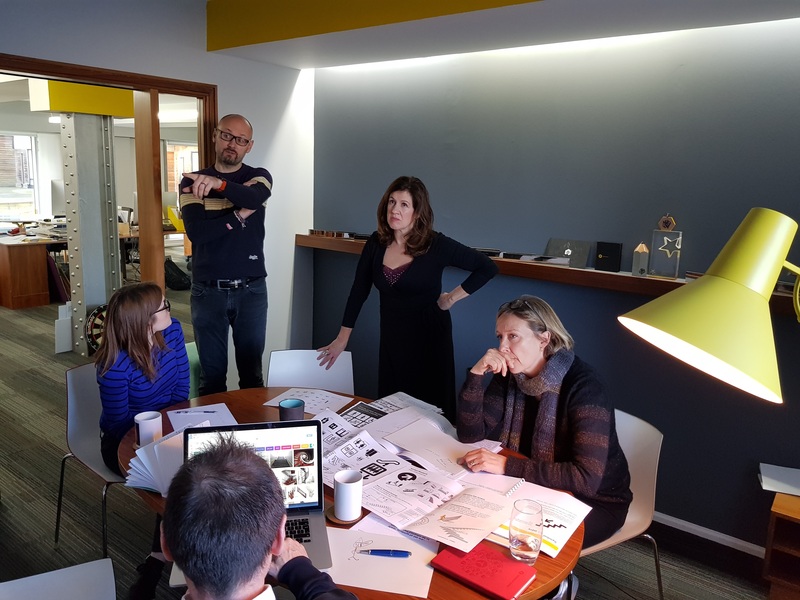 In a room of creatives, and members of our wider team, each symbol was discussed in detail for 10-15 mins. 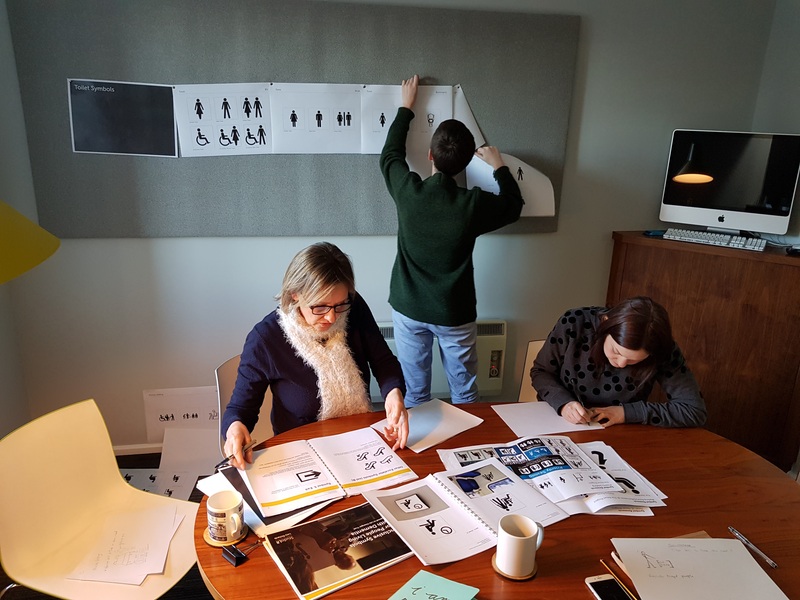 This included reviewing our scoping exercise to compare variations on each symbol, comments from the focus groups we held with people with dementia, and generating sketch concept ideas for a new version. What did we learn from the workshops? His head looks like it’s falling off! The detached head on the current ‘symbol man and woman’ is used consistently across all variations. It’s really odd, and potentially confusing for those with dementia. It’s easy enough to design a toilet symbol as it has a physical form. How could we represent ‘giving information’? Some symbols are easier to review than others. Symbols such as information or exit are challenging to distil into a simple visual idea. It is also interesting to consider the longevity of our interpretations (particularly for symbols impacted by digital technologies such as tickets). Should we design this in 3D or 2D? 3D symbols are more readily understood but needs some consideration around clarity and simplicity. 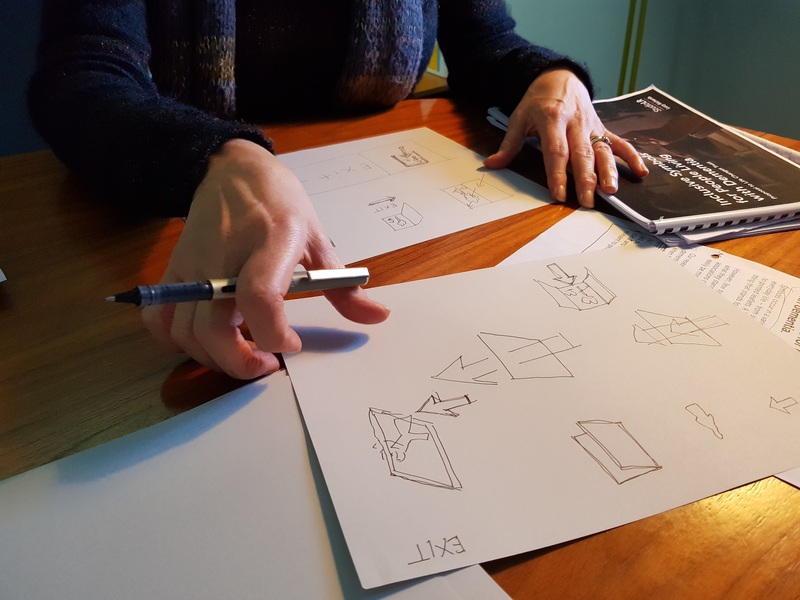 We need to be careful not to include too much detail in a 3D representation, further complicated by the introduction of a person to reinforce an action. Our 2D vs 3D conversation sparked some debate around the representation of people in symbology. 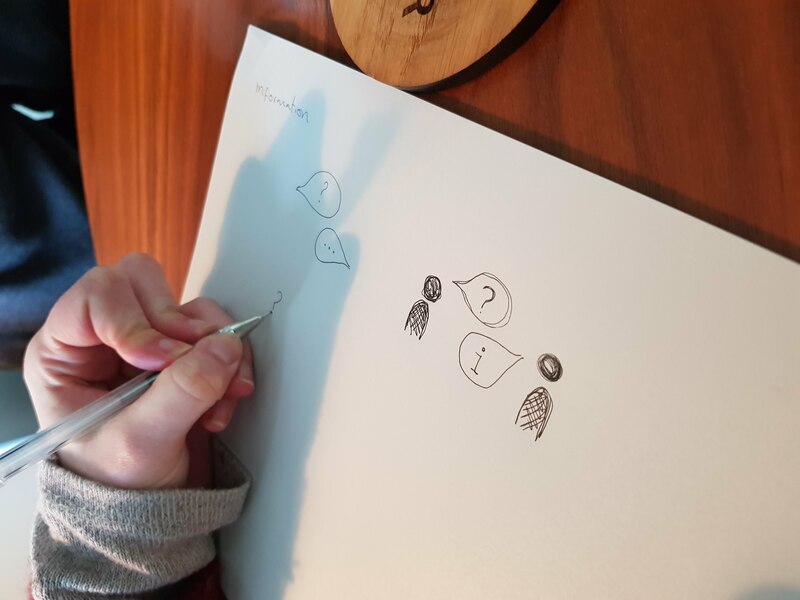 Understanding that more detail often leads to more questions and literal interpretation from those living with dementia, our initials sketches show a person represented in a solid ‘blobby’ gender-neutral form, enhanced with more realistic body shapes and features. Will using an arrow help make this symbol clearer? The symbols are used to trigger an action and to help with wayfinding. We discussed including arrows within the symbol (i.e. arrow for exiting a door) but decided this could be confusing for literal interpretations. An arrow within a symbol supported by a directional arrow on the same sign could really confuse people! We’re interested to find that the blue P represents parking internationally, regardless of each country’s alphabet or language. We’re recognising how valuable the review of language and the words we use will be to supporting each of the symbols. 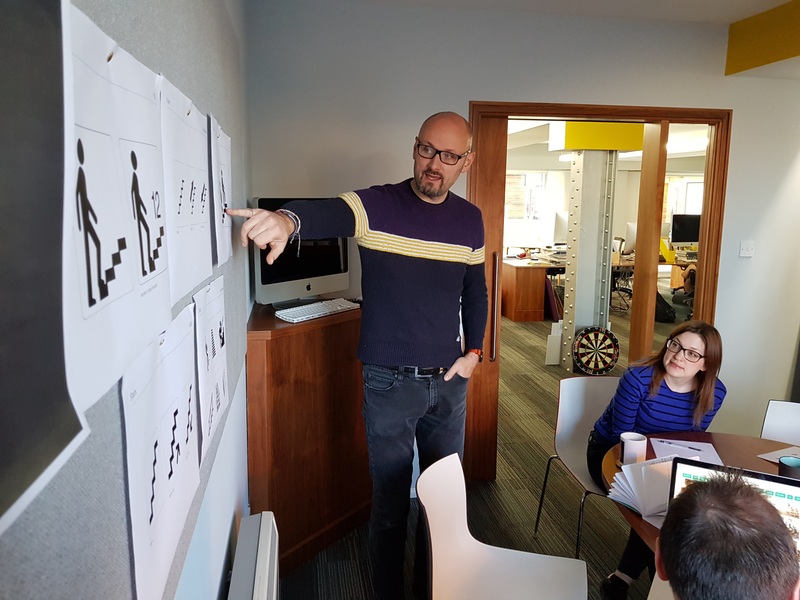 After lengthy discussion we agreed that this symbol is too challenging to design without the benefit of feedback from the focus group on current versions (this symbol came into play recently and so it wasn’t included in the research project). We decided not to attempt a redesign of this one as part of this project but perhaps in the future, if we were armed with relevant research. Moving in 2018, we’ll be completing the first concept design options of the new symbols in January. These will then be evaluated by living with dementia people from across the UK, facilitated by our research partner in February.